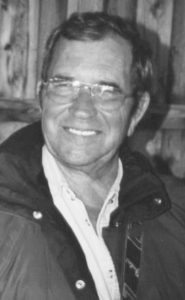 EDOUARD DESJARDINS of Hillspring, Alberta passed away peacefully at the Pincher Creek Hospital on Monday, March 5, 2018 at the age of 83 years. He was born in Ste Amélie, Manitoba on May 23, 1934. Edouard is survived by the love of his life, Barb; his 3 daughters Roxanne “Bunny” (Louis) Debroux of Lundbreck, Rita “Cookie” (Cal) Graham-Mazur of Calgary, Rhonda “Candy” (Trevor) Kunkel of Hillspring and daughter of his heart, Brandi Meyer of Edmonton (Keelan, Axson) and; his grandchildren Tanya (JC) Debroux, Kyle (Carol) Debroux, Rylan Kunkel and Ronan (Abby) Kunkel, as well as five brothers, four sisters and numerous cousins, nieces and nephews. He was predeceased by his son Richard “Ricky”, his parents Alexandre & Delphine (née Chaput) Desjardins, two siblings, one son-in-law and two brother-in-law’s. At Edouard’s request, no formal funeral service will be held. In lieu of flowers, memorial donations in his name will be accepted by the Windy Slopes Health Foundation, PO Box 968, Pincher Creek, AB T0K 1W0. The family would like to extend a special thank-you to Dr. Parker and staff for their exceptional care and support. Our family will again be complete. Safe passage to the next world, till we meet again. Edouard played with us, when we were kids, on the farm, in Manitoba,in the forties. Rest in peace, dear cousin.